Improving your health is a long term cause that can start today. You have to teach yourself new habits and drop the old bad ones. Picking some of these up will help reduce the chance of illnesses, help you shed a few pounds, and even boost your overall mood and well being. Eat Breakfast: Always make time for breakfast to avoid overeating later in the day. Eating a healthy breakfast filled with a balance of high fiber carbs, lean protein, and healthy fats helps give you a steady flow of energy through the days, while controlling your hunger. Bottom line is healthy fit people eat breakfast! Be Active: You should perform at least 150 minutes of exercise each week. This averages out to about 30 minutes 5 days a week. 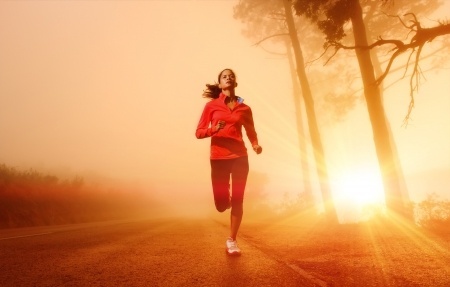 Find workouts that you enjoy doing like jogging, walking, cycling, swimming, or even dancing. The more you enjoy it the more likely you’ll stick with it. Quit smoking: Smoking is the leading cause of heart disease, lung cancer, memory loss, and so many more ailments. It’s just not worth it and you can invest all that money you’ll be saving into bettering your health instead. YOU CAN QUIT.. All it takes is will power and motivation. Maintain a healthy body weight: Being overweight can lead to diabetes, heart disease, and many other problems so make sure you’re making healthy decisions about your nutrition. Eat more fruits and vegetables and cut out Trans fatty and processed foods. A healthy nutrition plan along with regular exercise will help get you to a healthy weight. Add fish to your diet: Certain fish, such as Mackerel, Salmon, and Tuna are an excellent source of omega 3 fatty acids, which is great for cardiovascular support and mental health. Cut back on the beverages: Sometimes drinks can have more useless calories in them than food. Don’t drink away your calories. Switch to water, your body will feel better and you’ll cut out a lot of extra calories so you can lose weight easier. Cut out the salt: Having too much salt in your diet can lead to high blood pressure. It also causes fluid retention and an overall imbalance in fluid levels in the body. Most processed foods are packed with high amounts of sodium so make sure you know what you’re eating. Focus on the food labels: Make sure you’re reading the food labels on all your favorite foods. It’s so important to know what’s in your food to make sure you’re not eating over your daily recommended intake. Find better ways to deal with stress: Everybody has their own way of dealing with stress, but is it the most efficient way? Find healthy ways to cope with stress like taking walks, exercising, or just meditating. Dialing back the stress can actually help you lose weight as well. Get a Good Night’s Sleep: Strive to get 8 hours of sleep a night. This will help cut cravings, lower stress, maintain a healthy weight, and elevate your mood. Also, try to sleep early so you can wake up early and start the day right.